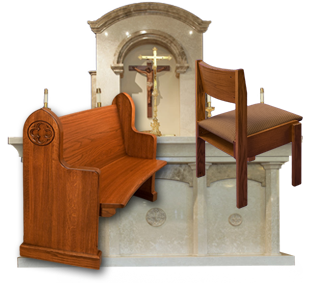 Aluma-Kneel Aluminum Kneelers provide churches with a lightweight alternative to traditional wood and metal frame kneelers. Our kneelers are built from high grade 1” square aluminum tubing, providing a lightweight frame without sacrificing strength and durability. The same 1” tubing is used for the kneeler legs and arms. There are no plastic or pot metal die cast parts used, which helps to ensure that no cracking or breaking occurs. The use of 1” tubing also provides a sleek kneeler design. 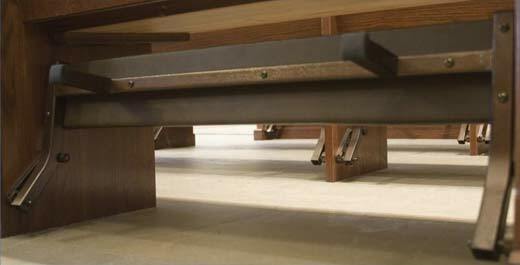 Our deluxe Aluma-Kneel kneelers are attached to the pew using a ½” thick kneeler bracket. The kneeler bracket is machined from 1” thick aluminum stock, as opposed to the use of a pot metal die cast method. This material choice eliminates the likelihood of the kneeler bracket warping or breaking over time. Call Ratigan-Schottler today and we will provide you with a proposal for a new installation or replacement. If desired, a sales representative can also provide your committee with a presentation at your convenience. Frames of lightweight aluminum, finished in a color of your choice. Kneelers pivot quietly on nylon bearings. Pads use a 5/8" plywood base with a 1 1/4" high density poly-foam, covered with a choice of color from a nice selection of innovative vinyls. Supports have large rubber feet that will not dig into floor or carpet. 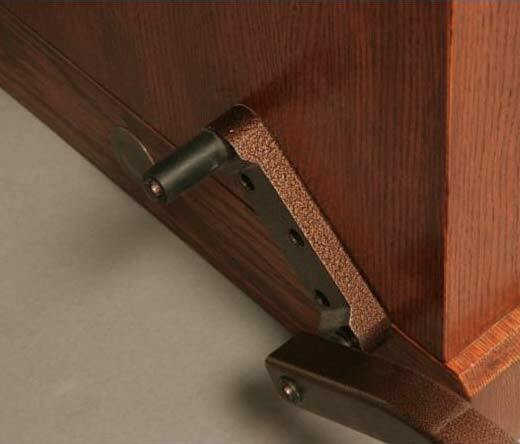 Kneelers, when folded, rest on a rubber bumper integrated into the kneeler bracket. Kneeler, when folded, is out of the way for easy dusting or vacuuming. 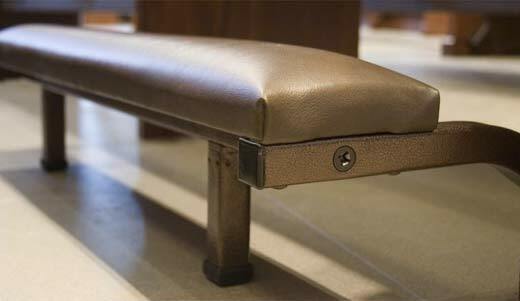 Due to a large selection of arm and hardware styles, kneelers can be installed on any pew regardless of age or design. 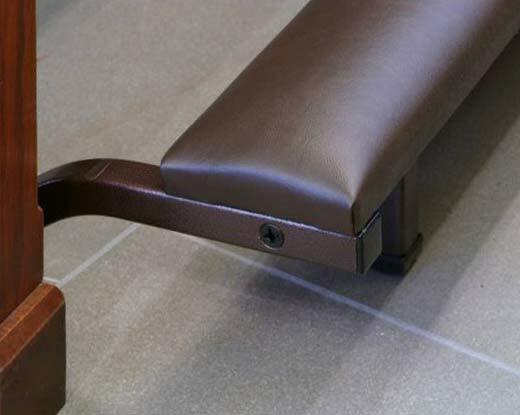 Ratigan-Schottler also offers our exclusive Aluma-Quiet kneeler bracket, which provides for a soft landing of the kneeler, to help reduce the noise of the kneeler hitting the floor. 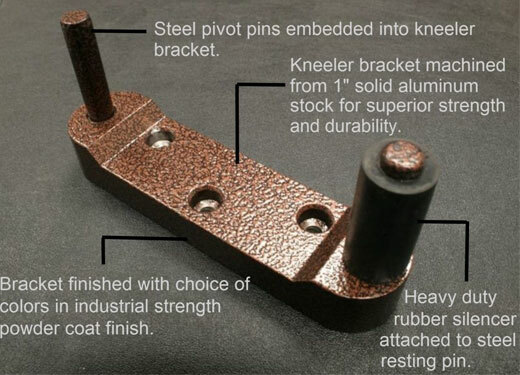 This bracket can be used on both our Aluma-Kneel and our solid Oak kneelers. Ratigan-Schottler also produces a solid Oak upholstered kneeler for those who prefer wood kneeler construction. 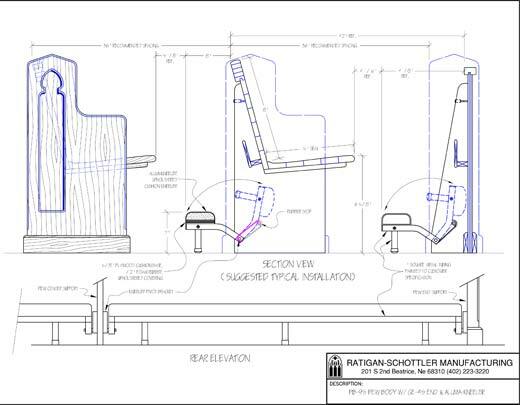 Ratigan-Schottler also produces custom kneelers to fit any situation we carry a full selection of mounting brackets and hardware to meet any kneeler installation requirement. Along with a full line of kneeler replacement parts and kneeler pads. Ratigan-Schottler’s exclusive solid Aluminum brackets can be used as a standard replacement bracket for damaged or worn out mounting brackets. Its solid Aluminum construction along with superior rubber kneeler bumpers provide for trouble free service for a lifetime.